We live in a unique time. Never before have there been such magnificent opportunities for impact, influence, affluence, knowledge, entertainment, creativity, experience, expression, information, and fame. If you’re like me, you want all the things. Yet with great opportunity comes grave responsibility. For every “yes” we give, every moment we spend on our phone or every hour pursing recognition or entertainment, we are saying “no” to a million different opportunities. I think we inherently realize this loss, the slipping away of what could be; so to compensate for the constant los of opportunity, we opt to over-stuff our days, calendars, inboxes, schedules, phones, and to-do lists. After all, we want all the things. But life doesn’t allow us to do all the things. It can’t. We all get 24 hours in a day and our days are all numbered. Which means we have to choose wisely. While we can’t do ALL the things, God promises that when we do the RIGHT things, He ensures we receive the BEST things. We can choose to fill our schedules to the max in an attempt at manipulating our destiny; or we can choose stillness and honor God’s sovereignty, goodness, and plan. We can choose entertainment; or we can choose time with our King and Savior, trusting His presence is far more valuable. We can choose screen time; or we can choose face time with our precious ones, trusting God to grant us an influence and legacy that lasts for eternity. So how do we seek first His Kingdom and His righteousness when everything competes for our time and attention? 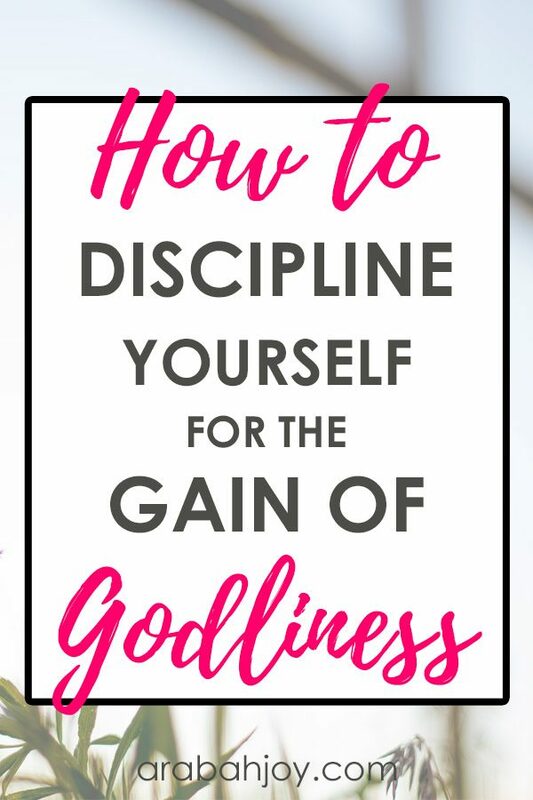 I Timothy 4:7 tells us to, “Discipline yourself for the sake of godliness.” Discipline is the path to seeking what’s best and making the best choices for our one, fleeting life. Discipline may not be a very exciting word, but the rewards of discipline are everything we truly want from life. It’s worth the effort of cultivating discipline into our lives, even when our attempts fall short. Don’t give up! 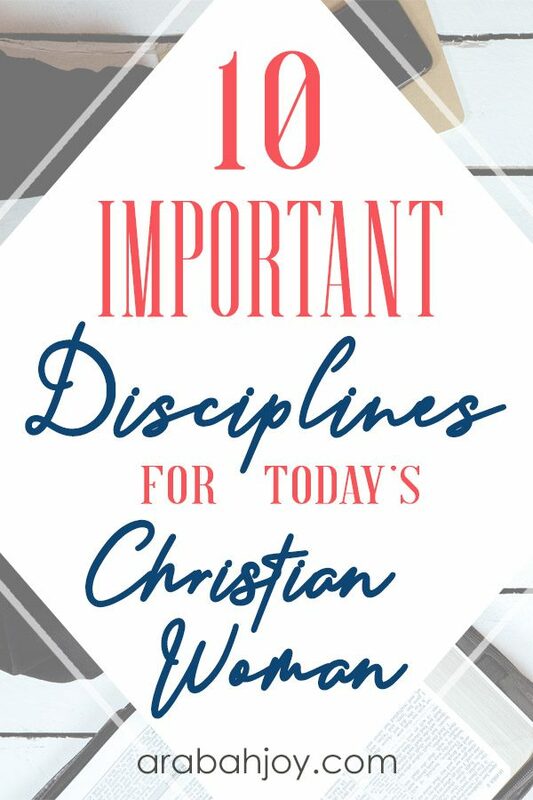 Here are 10 timely ways to discipline ourselves for the sake of godliness in our noisy, opportunity filled world. Psalm 46:10 tells us to, “Be still and know that I am God.” Stillness is critical in understanding and honoring the God-ness of God. Without taking adequate time for stillness, we tend to revert to being our own god, solving our own problems, managing our own lives. Not good. The godly woman will take time to be still. Check out these 5 Ways Stillness Helps us Know God and these 3 Tips for Cultivating Stillness into Your Life. In our “go big or go home” world, it’s easy to believe that without big followings, likes, platforms, or profiles, we aren’t significant. Especially as women, it seems the “normal” way of life is to clamor for personal attention. Yet Jesus instructed us to take the lowest place (Luke 14:10) and Peter reminds us that God exalts the humble. We must remember that big does NOT equal significant. Jesus compared the Kingdom of God itself to a mustard seed, the smallest of the small (Matthew 13:31). We reflect the gospel when we faithfully sow small seeds, walk in humility, and seek to honor others above ourselves. There are many blessings to Western Christianity, including freedom and the abundance of Christian resources. But those very blessings can handicap us if we aren’t careful. It’s far too easy for us to rely on someone else’s study of Scripture instead of doing the hard work of studying the Scriptures for ourselves. Sadly enough, we don’t even realize our level of compromise, designating just about anything as “Bible study,” from fill in the blank workbooks, to reading someone’s book that includes a few Scripture references on a topic. A godly woman must 1. 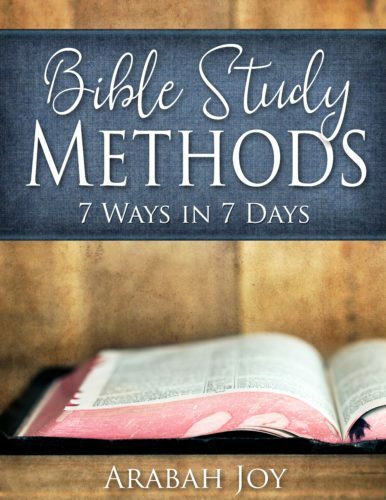 Know what Bible study is (that is the personal study of God’s actual word, not filtered through someone else’s lens.) and 2. Regularly and systematically study the Word. Oh, and if you’re wondering WHY Bible study is such a big deal, check out these 21 AMAZING reasons to study God’s Word. #sold! It’s never been easier to give up, be it on a marriage, on parenting, a career, or schooling. I learned this principle in college- X amount of money invested each month at y interest rate = That’s the power of consistency. Small (see habit 3) consistent actions far outweigh periodic big ones. 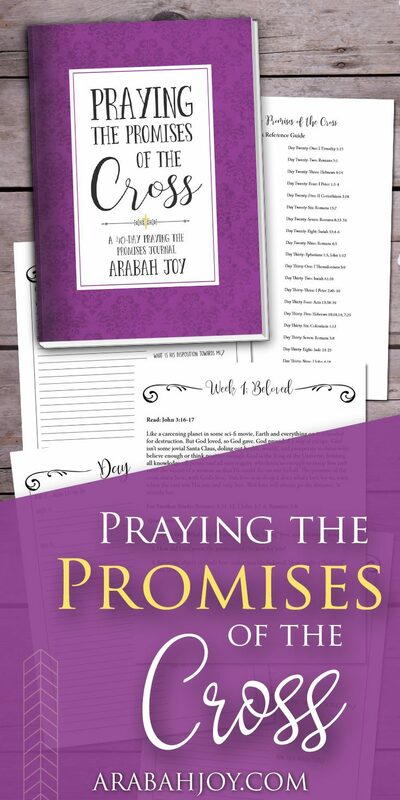 In my biblical goal setting workbook, Grace Goals, I talk about habit goals. These are goals which focus on cultivate small habits rather than a big result. What habit goal do you need to set? Proverbs 22:9 tells us, “A generous man will himself be blessed, for he shares his food with the poor.” A generous woman is kind and unselfish with her possessions, including her time, affections, energy, and money. She gives freely and does not expect repayment in return. Although God’s Word tells us we will be blessed for our giving, it is not our primary motivation for being generous. Having a generous heart directly reflects the heart of God. God showed us the ultimate example of generosity when he sent His son to atone for our sin. When we are generous, we are displaying the true character of God. A godly woman must look to Christ to see and comprehend spiritual realities. It’s the only way we can live transformed and set apart! When we choose to behold Christ, we can’t help but to be transformed into His likeness since we become what we behold. Beholding Christ in our everyday lives takes purposeful effort. The world has a bazillion other things that could capture our gaze…yet when we meditate on God’s Word we see clearly His purposes, will, goodness and character. The more we behold His glory, the more clearly we reflect His image and reflect His character to others. We all have desires and ambitions. How we see and interpret life is usually what drives those desires and ambitions. 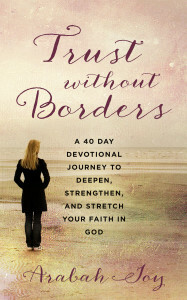 Through studying Scripture and consistent prayer, a godly woman gets her vision for life from God. As we come up with and plan our goals, we should ask ourselves, “Do my desires and ambitions line up with Scripture?” and “Am I dreaming big enough?” We must have a godly hunger for God’s will in our lives. Our desires should not come from selfish purposes, but they should come from truly wanting to do God’s work. God’s promises lead us to align our visions with His. When we know the promises God has made to us, it helps fan passion, purpose, and vision and allows us to better understand the trials we face as we patiently walk through times of need. We live in a world full of distractions. There is too much information, too many choices and too many opportunities. We’re being pulled in a thousand different directions and social media seems to always be competing for our attention. All of these cause our hearts to be overwhelmed, anxious, and troubled about many things. These things can also distract us from God and His will for our lives. Godly woman should guard their lives and their commitments so that when God sends us divine appointments we can focus on what He has called us to do. When we say yes to everything, we can miss out on being able to say yes to the right things, to the appointments God has set for us. If we are constantly distracted we can miss out on being able to counsel a child in need or a friend who just needs us to listen. It’s not easy to live a life of simplicity in the age we live in. There is so much noise and clutter competing to steal our peace and intimacy with Christ, but when we slow down and seek God’s will for our lives it becomes easier. If we are overwhelmed and stressed out because we have over committed ourselves, we are not bearing the image of Christ. Godly women feel a strong need and urgency to examine their own hearts and repent of their sin. True repentance comes when we have a deep desire to live our lives worthy of God’s grace and mercy. The more we behold Christ and see His holiness, the more our sin should make us mourn and seek restoration with Him. We then become sensitive to the Holy Spirit’s conviction of our sin and we are quick to respond with confession to Christ. 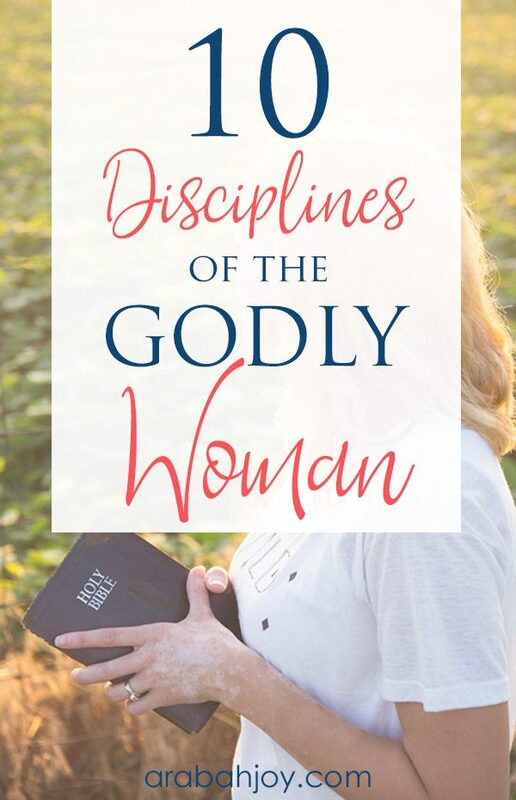 Godly women not only repent of their outward sin that others may be able to see as well, but also of their inward sin that is rooted deep in our hearts. To truly repent we must first be honest with ourselves about our sin. We have to acknowledge our need for forgiveness and know that God is ready to freely give it to us. As women it is easy to try to hide from our sin or even blame our emotions or full schedule for our lack of patience and anger, but only when we come honestly to the feet of Jesus and repent can we experience the full freedom of Christ’s forgiveness. When we are true to repent we can be sure of God’s forgiveness and unfailing love. We can hold onto the promises He has made to us throughout Scripture, accept his forgiveness, and “Rejoice in the Lord and be glad, you righteous; sing, all you who are upright in heart!” (Psalm 32:11). Because we do live in an age of endless distractions and overwhelm, it feels much harder to make real life connections. It seems so much easier to send a text or comment on a friend’s social media post. It may also be a little more comfortable to us now since we have been communicating this way for some time. Sadly, you don’t have to venture far to see the majority of people close by all looking down at their phones. Face to face connections are becoming less of a priority. Nothing, however, can take the place of real life connections. Forming real life relationships can be hard work and take commitment. They may also require humility and courage. God did not create us to have relationships online only. He created us for face to face connections and community that spurs us one to good works. Just as they broke bread together in Acts, God wants us to do life together. He wants us to encourage one another daily to keep Christ in the center of our lives. Since we live in a fallen world, real life relationships can be difficult. We are not to give up on people when things get tough. We are to stay through the mess and show God’s love, grace, and mercy when others need it most. Without IRL friendships, we shortchange ourselves the opportunity to grow in this way. What do you think? 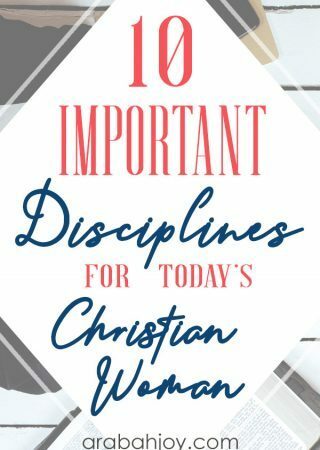 Is there a discipline you feel is essential to add to this list? 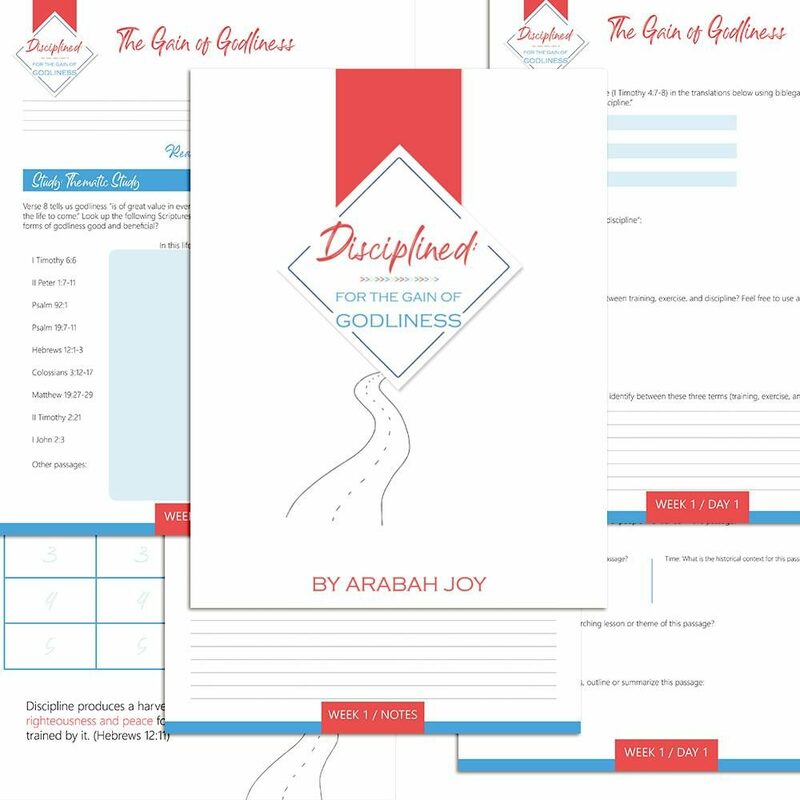 Which characteristics of a disciplined person do you feel the need for most in your life? It may not be easy… but it is oh, so worth it. 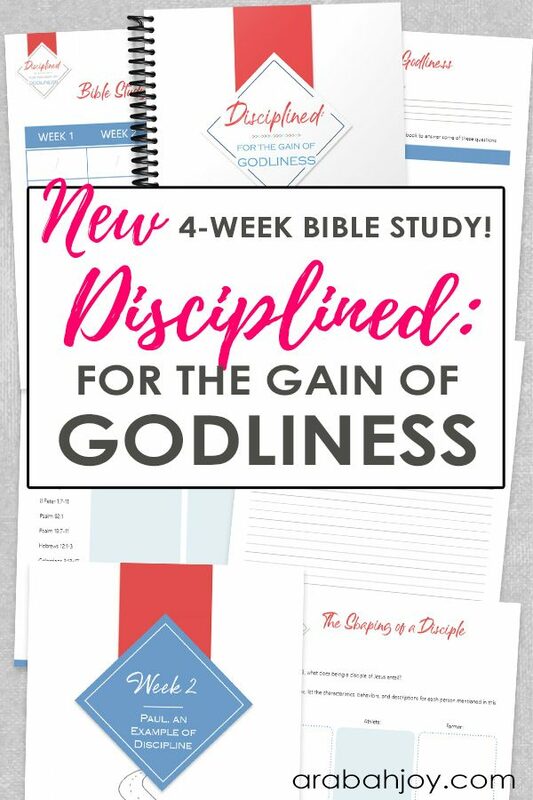 Before you go, check out our 4-week Bible study on Discipline: For the Sake of Godliness. It’s available in our shop here. 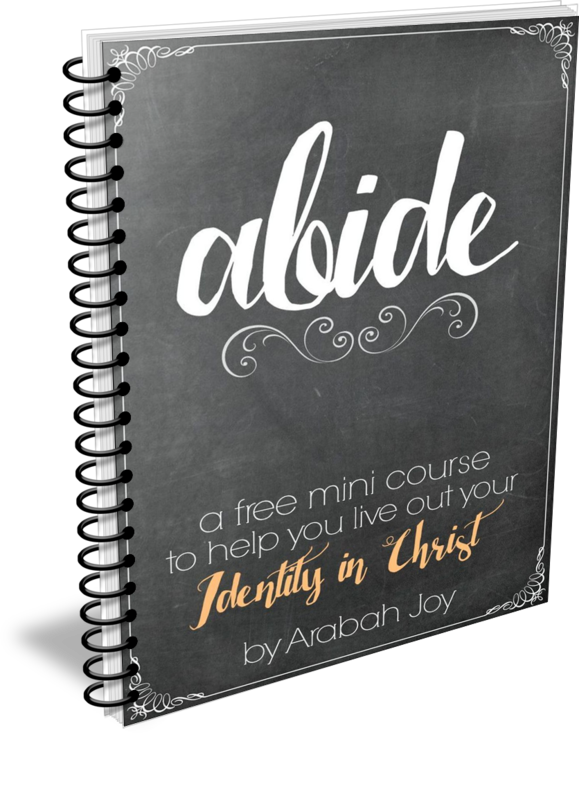 Great post Arabah! 3, 4, and 7 really resonated with me.IT is tough when you work full time and trying to run a business on the side. However, I know I am where God wants me at this moment. Consistency is something i have always struggled with but have made the commitment to follow through this time around. Staying in God’s word was never really a problem I would just forget because my days would and still do get busy. I am getting better at this though intention. My God-Given dream seems so big it scares me! But I am taking it a step at a time.